Have you ever asked yourself, “how can I increase the performance and reliability of my customizations and extensions?” and you just didn’t know where to start. Or the pressure to meet those new project timelines makes you cross your fingers and say, “we’ll check for quality in the next release”. And all you wanted was a quick way to check for performance and reliability issues and reduce the risk for your Common Data Service (CDS) for Apps implementation. Well, starting from TODAY, we are excited to announce that there is now a way to do this directly in the web.powerapps.com. The PowerApps team is rolling out the new Solution checker feature into Public preview. With Solution checker, you can inspect your code against a set of best practice development rules specific to customizing and extending the CDS for Apps platform. Get access to rich detailed reports listing issues identified, severity, locations, and sometimes the line code, with linkage to detailed prescriptive guidance on how to fix the problem. Solution checker has been in Private preview and we’re already seeing some great results and value driven back to customers. From initial checks reporting 100’s of issues in their customizations and extensions, customers have been repeatedly using the checker to reduce issues to 0 and improve the performance of their customizations. See below on how you can begin using Solution checker to improve the performance of your own CDS for Apps implementations today! Solution checker is now available in all regions . How do I enable Solution checker in my environment? 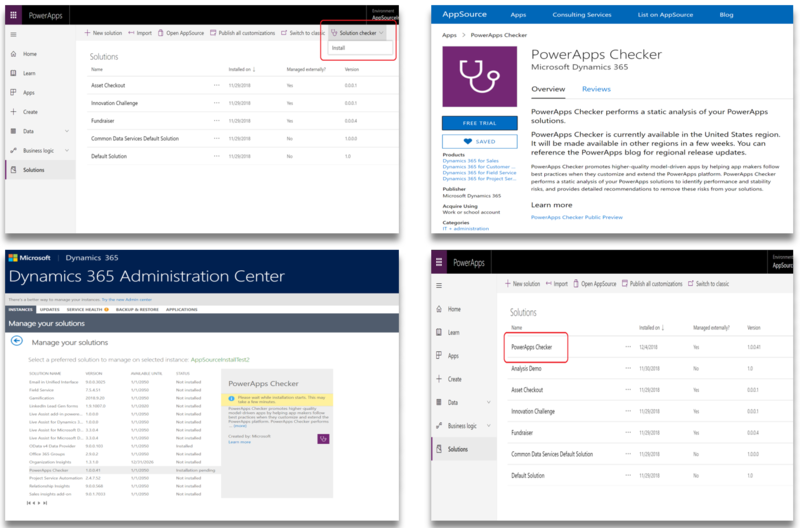 The Solution checker becomes available in the Solutions area of PowerApps after you install the PowerApps checker solution. Notice that you can’t find it by browsing or searching on Microsoft AppSource. You must install it by following these steps. Sign in to PowerApps and select the Common Data Service environment where you want to enable the Solution checker. On the left navigation pane, select Solutions. On the toolbar, select Solution checker and then select Install – this opens the Microsoft AppSource page. You must allow popups if your browser blocks the page from opening. Select Free Trial on the AppSource page. If you agree, accept the terms and conditions and select the environment to install the PowerApps checker solution. When the install is completed, refresh the Solution list on the PowerApps site to verify that the PowerApps checker is available. How do I run a check on my Solution? After you install the PowerApps checker in your environment, a Solution checker menu item is available when you select an unmanaged solution in the Solutions area of PowerApps. In the left pane select Solutions. Next to the unmanaged solution that you want to analyze, select …, point to Solution checker, and then select Run. The status pane located in the upper right of the Solutions page displays Solution checker running. Note the following. The Solution checker can take a few minutes to complete the analysis. During this time you will notice a Running… state in the Solution check column of the Solution list. You receive an email notification and a notification in the Notifications area of the PowerApps site when the check is completed. Select Download last results to view the report containing the issues identified, severity, locations and the prescriptive guidance linked when the check is completed. What components in my solution are checked? The Solution checker will analyze the below solution components for issues. 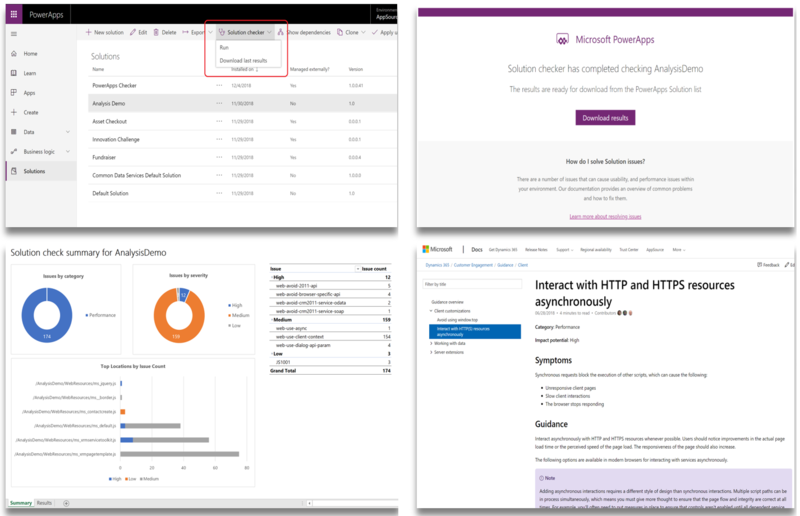 The best practice rules used by PowerApps Solution checker can be referenced here. There is still more work to do for the Solution checker, and we will be enhancing the experience with new features over the coming weeks as well as constantly increasing the check coverage with new rules for performance and reliability added. Let us know what you think of the experience, where we can improve and stay tuned for further updates as we iterate and build on the preview release.